Strawberries are everywhere in Italy these days. Everywhere I turn, their heart-shaped red silhouettes wave a big hello at me. 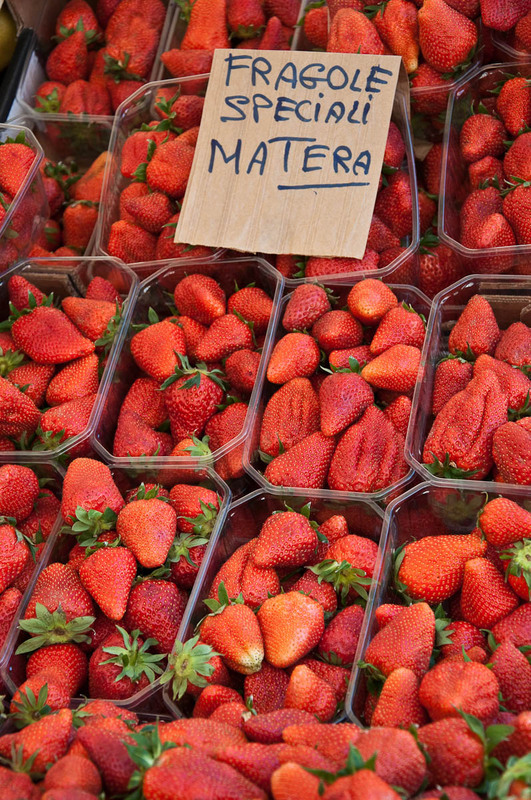 From my local fruit and veg shop, where a whole crate of them costs only 5 euros to the 800-years old market in Padua, where strawberries all the way from Matera in the Southern Italian region of Basilicata fill the air with their impossibly sweet scent. 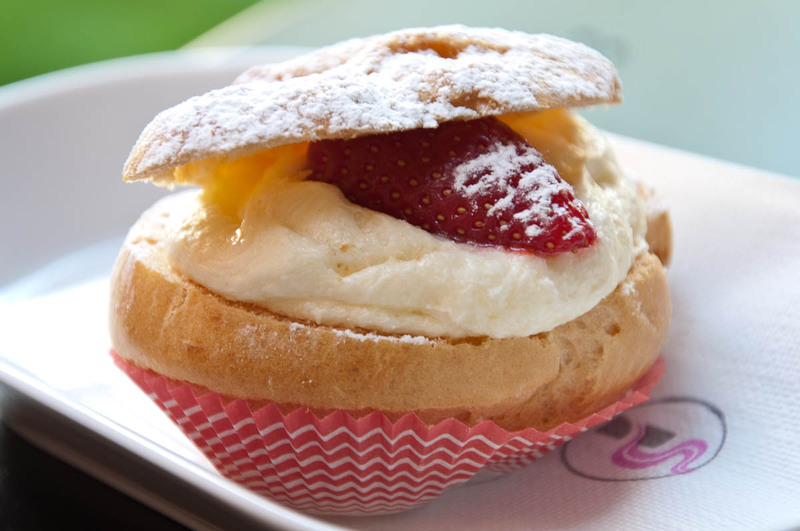 At my local patisserie when I ordered a small sweet to go with my coffee, it came garnished with a slice of strawberry. Which was great! As this is just the right environment I am used to see strawberries in. Covered with thick whipped cream, dipped in mouth-watering chocolate, adorning an irresistible cake. 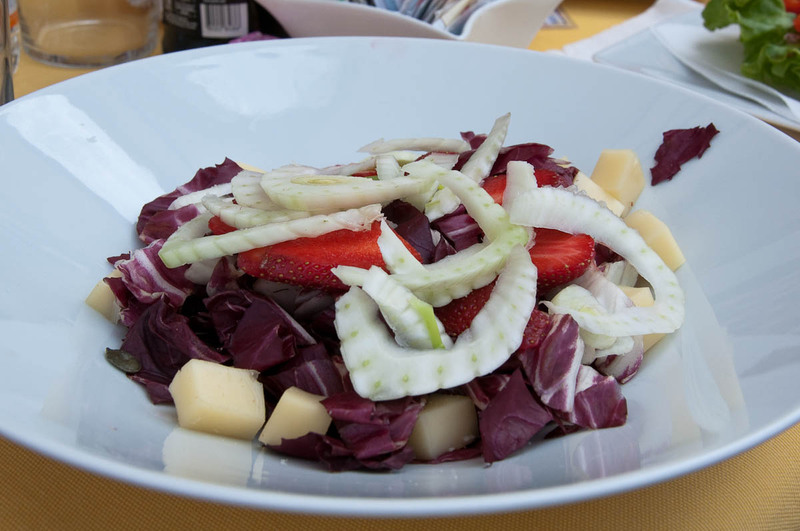 What I hadn’t expected though was to find strawberries in my salad here in Italy, too. You see, growing up in Bulgaria we had a very strict perception as to what goes with what. In terms of colours, clothing, food and several other things. Blue and green?! Yuk! Socks with sandals?! Bleurgh! Soft-boiled vegetables?! Oh my gosh, just the idea used to make me a bit ill.
As for strawberries, they were strictly to be used in desserts or to be picked from your mum’s strawberry patch, deep red and still warm from the rays of sun which had filled them with sweet juice, then you rinsed them and you ate them straight away, fresh and flavoursome, pure delight. So, years later, when a friend told us about being served strawberries dusted with salt in one of the first Vietnamese restaurants in Sofia, the Bulgarian capital, the general reaction she got from us was one of disgust. And of pity that they had spoiled the lovely strawberries with salt. Later on and with me already living in London, I was also rather shocked when a Polish housemate of mine cooked the following meal: boiled rice adorned with strawberries from a tin. She said it was very tasty. I didn’t want to cause a cultural offence, but I couldn’t bring myself to give it a try. Nowadays, I have left behind several of the self-imposed limitations from my youth. I am quite happy to experiment (although, come to think of it, socks and sandals is still a big no!) and in terms of food I am open to ordering a meal just because the mix of ingredients in it seems to be something which challenges my inner conventions as to what goes with what. So, we were spending the day in this little town called Este, about 40 mins away by car from the city of Vicenza, where we currently live. 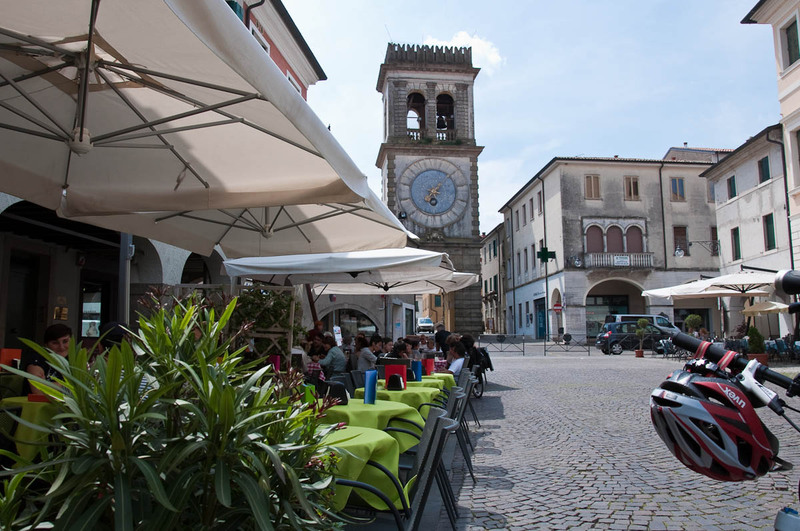 A beautiful gem of a town with a medieval castle, the grounds of which had been turned into a park, colourful houses, renowned handmade ceramics tradition and a tower with a fabulous clock. At lunchtime, we found a little cafe on the high street (just next door to the one pictured above). There were many cafes and restaurants to choose from, and we opted for this particular one as it had the most people on its tables outside and no-one of these people seemed to smoke right at that moment in time. There was a nice selection of light lunches, like bread rolls and salted croissants covered with seeds and stuffed with salami, greens and cheese, but a small menu with salads caught my eye. And then I saw it! 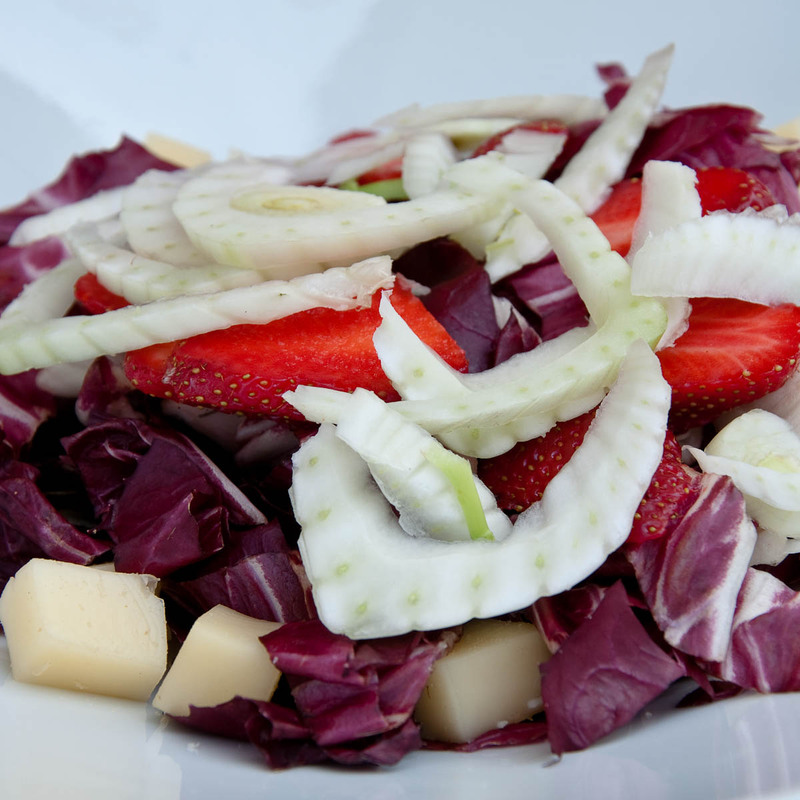 Salad number 3 which was a mixture of red radicchio (also called Italian chicory), strawberries, fennel, pumpkin seeds, and cubed cheese. Strawberries in a savoury salad?! It was just too much, so, obviously, I had to have it. My husband asked me twice if I was sure about it. I confirmed. So, we ordered it. After a pleasant wait, our meals came. And my salad was served in a sparkling white deep plate. It looked fresh and very seasonal. The waitress also brought me a bottle of balsamic vinegar, so I poured it generously over the vegetables and, ahem, the strawberries, too. What can I tell you?! It turns out that strawberries in a salad taste rather good. The balsamic vinegar somehow emphasised their sweetness, by cutting through the sickliness of it. The strawberries also added a nice contrast to the slight bitterness of the red radicchio. They were soft and mushy to the pumpkin seeds’ crunchiness and the cheese balanced it all off. Later on that night, I looked for more information about using strawberries in savoury meals in Italy. It would appear there is a certain tradition in this respect. 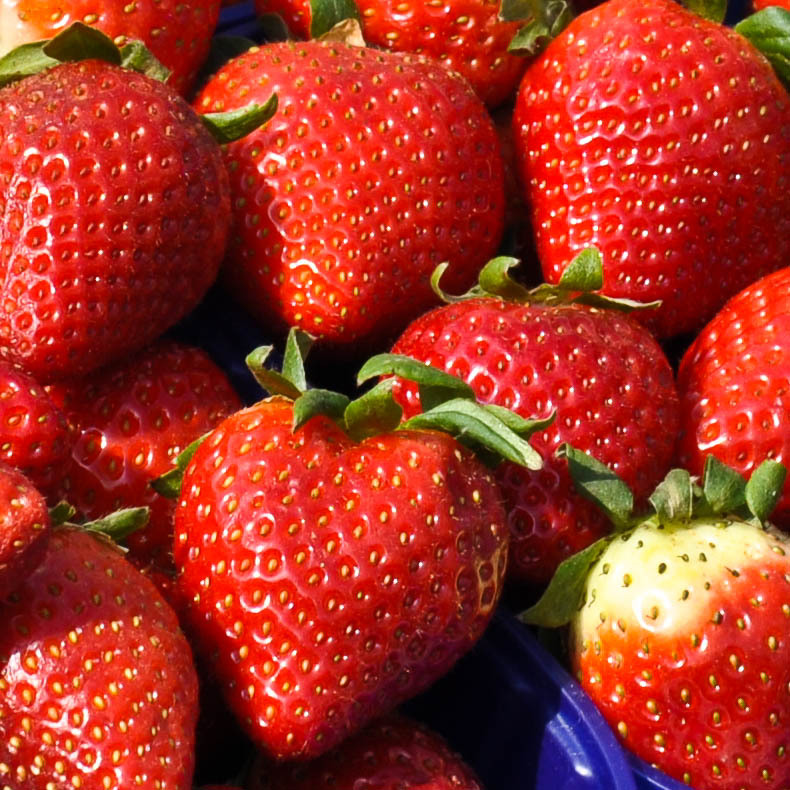 Strawberries are added not just to salads, but also to risottos and are even served simply sprinkled with vinegar and orange juice. I found the best piece of information in my book on traditional Venetian cooking ‘Venezia in Cucina/The Flavours of Venice’. Apparently, in the 19th century a dish made of rice, peas and strawberries became Venice’s symbol for the struggle against the Austrian occupiers. The colours of the three ingredients replicate the Italian flag, so the cry ‘Risi, bisi e fragole‘ (rice, peas and strawberries) was shouted by the crowds against the foreign occupation. Are you adventurous when it comes to food? What is the most unusual dish you have eaten?